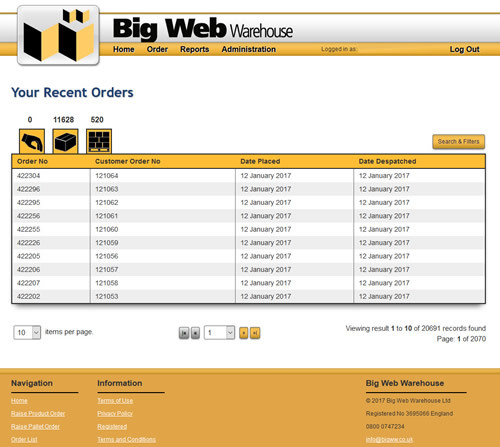 When we started Big Web Warehouse we looked for a warehouse management system that would gives us everything we needed to operate a fully flexible storage and fulfilment centre. Unfortunately we couldn't find anything on the market that gave us fast adaptability for an ever changing market and customer base. We decided to dedicate a team to develop a bespoke Warehouse Management System and then as technologies evolved implemented the online interface to give our customers total visibility and control over their pallet stock and collection orders. We operate hand held wifi enabled mobile devices and barcode scanning from booking in through to the despatch process that gives you real time data regarding your pallets and orders. You will be able to see when your pallets have been picked and are ready for collection.